When you are using a pattern, there are many markings on the pattern that need to be transferred to the fabric to obtain accurate results when you sew that fabric. 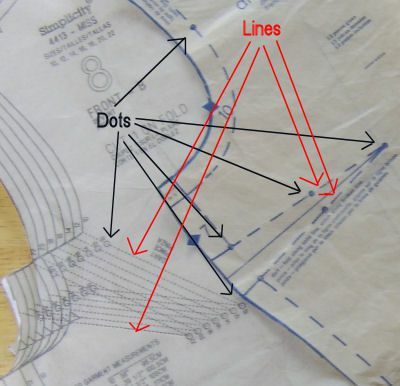 Dots: these are dots that mark locations for matching parts of the garment or item to each other, such as seam intersections, pockets, darts, collars and more. Darts: markings for darts are straight lines and dots. Matching them in the process of folding the dart is essential to making an accurate dart. Buttonholes & Button Placement: transferring the pattern markings for these items ensures that they will be evenly placed on the garment. Other Items to Transfer: it is impossible to list all of the markings that you may want to transfer. 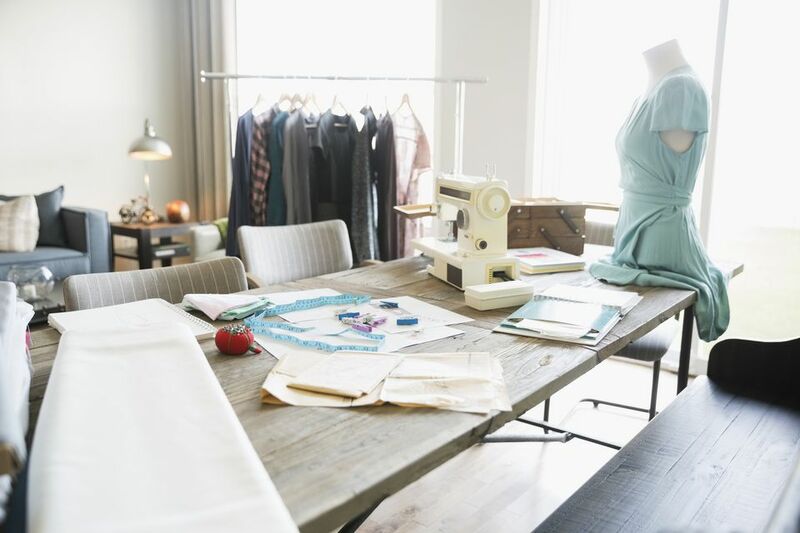 The things to keep in mind are the markings that will line up other pieces of the fabric, things that create folds, tucks or pleats and things that will show you the placement for add-ons such as buttons. There are many types of fabric marking tools available. The tool you use will be a matter of preference in most cases. Dressmaker's Carbon is available in non-wax, wax and vanishing forms. They are all a sheet for transferring material. Tracing Wheels are available in a variety of forms. Wheels are smooth or spiked. Some have extra features such as a smooth area for pressure marking. Vanishing Tools: these are wonderful if you can sit and finish your garment. If you tend to "stop and go" your sewing projects, the markings may be gone before you are ready for that marking. Always test the chosen marking materials on scraps before you cut out the fabric. Test that they will not show through to the right side of the fabric and that the markings are removable. The photos in this article are using a high contrast marking color for visibility. You would use a color that is close to the fabric color but visible. Read the package directions for more information. Leave the pattern pinned to the fabric. Fold the carbon paper in half so that it is long enough to mark the intended area. For lines, use a straight edge such as a gauge or ruler. Line the straight edge up with the line. Run the wheel along the straight edge. Check that the markings are on all layers of the fabric. For dots, find the center of the markings. Make an X through the center of the dot. Place a straight pin straight through the dot on the pattern piece. Mark the fabric with the chalk where the pin is in the fabric. Make an Adorable and Easy Poodle Skirt for Halloween and 50s Dances!